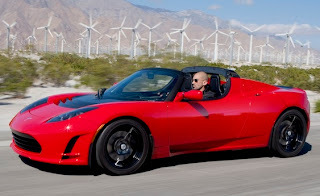 Leno gets the full showroom sales pitch on the Tesla Roadster 2.5 from Senior Sales Advisor Kyrstin Munson who really knows her stuff. The Tesla 2.5 Sport has the same 245 mile per charge range with a slightly faster 0-60 time of 3.7 seconds. Interesting info from the Tesla rep includes some insight into how the BMS handles temperature management in the different performance modes.